Friday featured disheartening amounts of nonstop rain and Saturday was miserably gusty and cold but today in the Greater Toronto Area it's spring in the most amiable way. We wandered around enjoying happy signs that spring has finally arrived (fat buds on trees, lawns covered with bluebells, robins perched proudly on telephone wires). 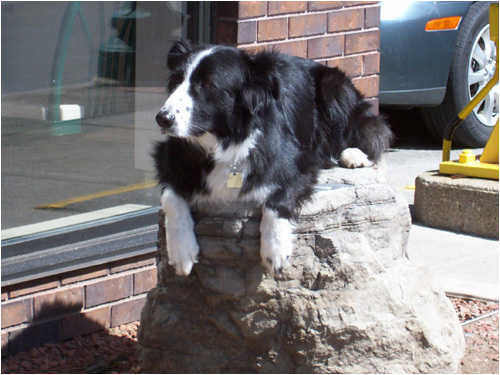 Then we stopped by a local Tim Hortons for soup and while we were inside a gorgeous Border Collie hopped blithely onto a rock outside the coffee shop window to await his/her coffee-buying people. That rock suddenly seemed like the world's coziest place to hang out and take it easy but I'd never seen a dog sit there before. Maybe this particular one lounges around up there every time his/her people stop by Tim Hortons, like a Buddha dog at one with the universe. After awhile a family with two young girls came by to pet him/her, which the mellow Border Collie enjoyed but the attention didn't compel him/her to move. Life was obviously good, up on that rock. Why would he or she want to move a muscle? Finally the dog's people emerged from inside the Tim Hortons and he/she jumped down and sauntered off with them down the street, as happy and at ease with them as he/she had been on the rock. I get the feeling this dog is like that wherever he or she goes.